Have you ever driven around with your bicycle mounted on a trunk-mounted bike rack, and then parked and went into a store or restaurant only to hope “I really hope no one steals my bike” because there was no effective way to lock it? I had this problem all the time while driving 10,000 miles with a Cannondale piggybacking on the back of a Alfa Romeo Spider during my Great American Road Trip of 2005. Kelly also had the same predicament in town whenever she’d return from one of the New Belgium Short Track races and stop at Big City Burrito for some grub. The difference is Kelly actually did something about it. She invented Trunk Locks. Trunk Locks is a braided stainless steel loop you shut in your trunk or hatchback when you need to lock your bikes (or anything else like a kayak) to your car. Keep it on while you drive, keep it on while you ride, keep it on all summer long if you’d like. Trunk Locks installs in literally one second and can be uninstalled in one second as well. I came up with this idea after a bike ride with my friends. We wanted to grab some lunch but I was hesitant to leave my bike outside because there was no way to lock it to the car. Locking it to my rack would be useless – it’s hooked to my car with nylon straps. After two years of development and the patent process, Trunk Locks was born. She has also entered it into Walmart’s Get on the Shelf competition, in which voting started today! Please vote for it here, or text 4882 to phone number 383838 from your mobile phone. 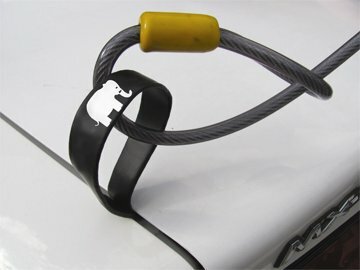 You can also purchase one of them at BicycleTrunkLocks.com. I have one myself and can attest that not only does it works great, but there is nothing else like it on the market!